Nissan was the No. 6 global brand in China in 2007. TOKYO – Nissan Motor Co. expects its sales in China to increase 4.6 percent to 570,000 vehicles this year, despite slowing industry growth due the global financial crunch. Nissans sales in China increased 19 percent to 545,000 units last year, outpacing 7 percent growth in total industry volume. Analysts forecast that the Chinese auto market will expand by only about 5 percent this year. While the countrys breakneck economic growth is clearly in retreat, the government is expected to introduce a stimulus package that may boost performance later in the year. Nissan sales should get a lift from that, as well as from a reduction in gasoline taxes and taxes on vehicles with engines under 1.6 liters, says Kimiyasu Nakamura, head of Dongfeng Motor Co., Nissans local joint venture with Chinas Dongfeng Group. Nissan will also benefit from an inland sales network that is more developed than that of foreign rivals, Nakamura said. Sales growth is seen moving to inland cities from coastal ones. Nissan was the No. 6 global brand in China in 2007. But it is playing a catch-up game in the worlds second biggest auto market, lagging behind Japanese competitors Toyota and Honda. Total sales at Dongfeng Motor Co., including heavy- and medium-duty trucks, climbed 16 percent to 708,000 vehicles last year. Nakamura sees another gain in 2009, but he declined to give a figure. Truck sales will be the weak link, pulling down overall performance, he said. Nissan wont be launching new models in China this year. Instead, it wants to polish the brand image of the four models introduced last year, including the X-Trail SUV and Teana sedan. Nissan also wants more local sourcing of drivetrains so it wont have to import them. Japanese transmission maker Jatco will open a new plant for continuously variable transmissions this year. The goal is to put CVTs into half of Nissans China products by 2012, Nakamura said. 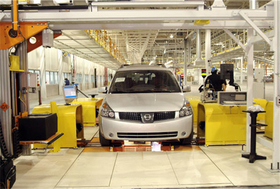 Last year, Nissan unveiled a business plan aiming for China sales of 1 million units by 2012.